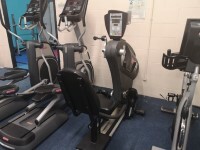 Archery, Aerial Skills, Boccia, Dance, Disabled Karate, Gym and Core Sessions, Holiday Club, Rebound Therapy, Spinning Classes, Table Tennis, Under 5s Activities, Yoga and Pilates and Youth Club. 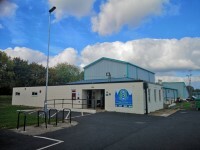 OXSrad is located on the outskirts of Oxford, just off Marsh Lane. 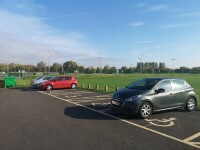 OXSrad has its own car park with Blue Badge bays. The bus stop is approximately 292 feet from the leisure centre. The nearest Railway Station is Oxford. 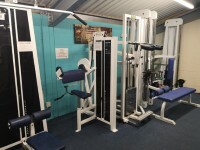 Oxford Station is approximately 3.8 miles from the leisure centre. 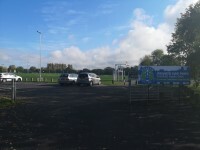 The car park is located off Marsh Lane. 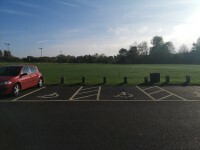 The dimensions of the designated Blue Badge parking bay(s) surveyed are 465cm x 420cm (15ft 3in x 13ft 9in). 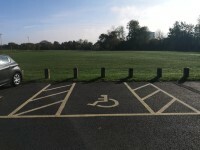 There are no parking charges for the car park. 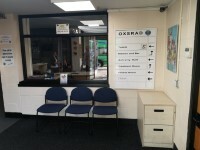 The reception point is located to the left as you enter. 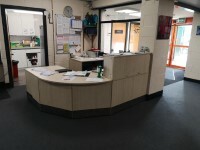 The height of the lowered section at the counter is 73cm. 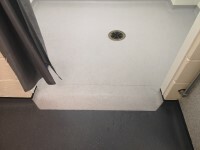 There is not a clear knee recess beneath the low/lowered section of the counter. 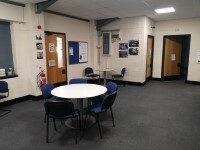 Music is played in reception and the seating area. You are on Eating and Drinking (Bar and Cafe). Skip to the next section. 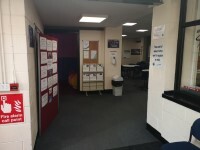 The café/bar is located ahead as you enter. 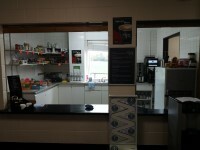 The height of the service counter is low (76cm or lower). 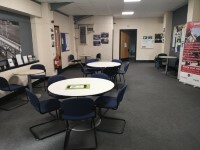 The nearest table is approximately 4m from the entrance/opening. You are on Sensory Room. Skip to the next section. 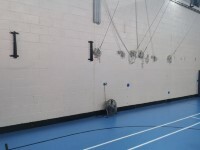 The Sensory Room is located to the left after you enter. 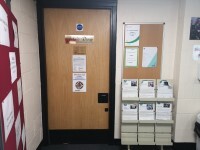 There is step free access to the room. 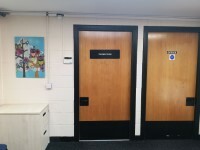 The door into the sensory room opens away from you (push), the door is single and has an opening width 92cm. The surface of the flooring in the sensory room is carpet. 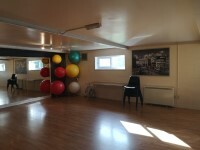 There are sensory lights and activities available. 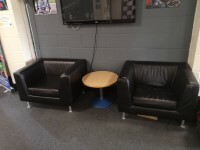 There is soft seating, flooring and bean bags available. You are on Treatment Room. Skip to the next section. 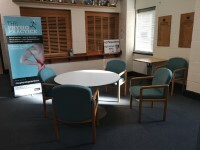 The Treatment Room is located to the right after you enter. 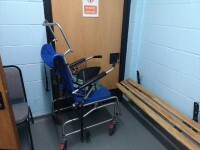 There is step free access to the treatment room. 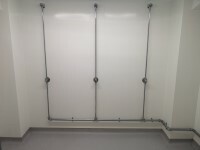 The door into the treatment room opens away from you (push), the door is single and has an opening width of 90cm. 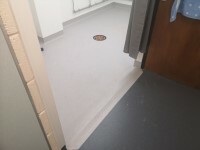 The surface of the flooring is vinyl. 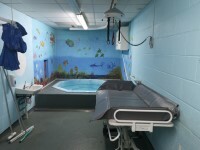 The changing bed in the Spa Bath Room can be moved into the treatment room if required. 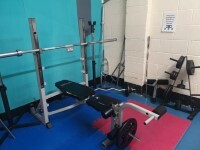 The hoists in the second photograph can be used in other rooms including the Sensory Room and the Sports Hall for activities like trampolining. 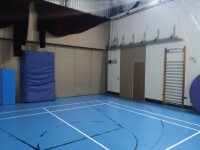 The Sports Hall is located to the left after you enter opposite reception. 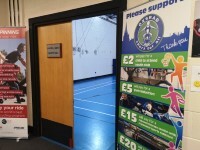 There is step free access to the Sports Hall. 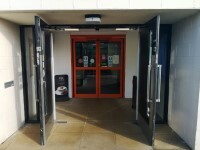 The door into the sports hall open away from you (push), the doors are double and have an opening width of 180cm. 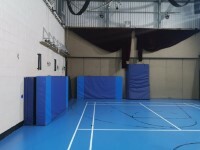 The Sports Hall can be used for a number of different activities and events. You are on Studio. Skip to the next section. 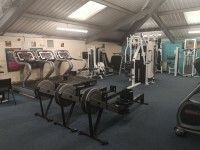 The Studio is located to the left after you enter, opposite the Sports Hall. 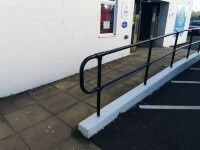 There is step free access to the studio. 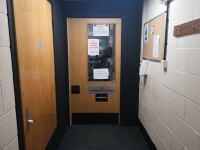 The door into the studio opens towards you (pull), the door is single and has an opening width of 90cm. 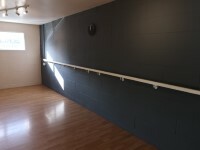 There is step free access throughout the Studio. You are on Spa Bath. Skip to the next section. 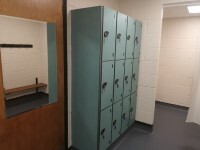 The Spa Bath is located to the left after you enter, opposite reception and to the left of the Sports Hall. 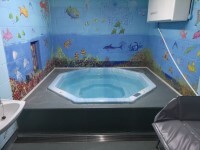 There is step free access to the Spa Bath. 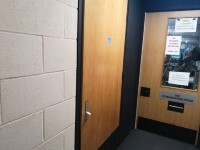 The door into the Spa Bath opens away from you (push), the door is single and has an opening width of 90cm. 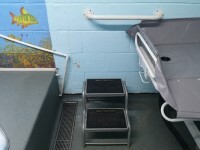 The Spa Bath can be accessed via either the ceiling tracking hoist or via two portable steps. The steps are 14cm high. 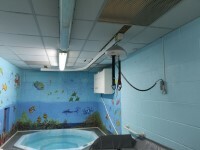 The ceiling tracking hoist covers the bed and the Spa Bath. 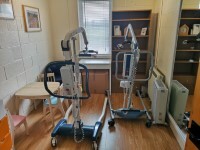 There is a free standing height adjustable changing bed. 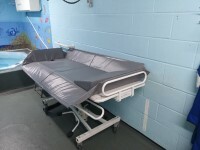 The changing bed is 180cm long. 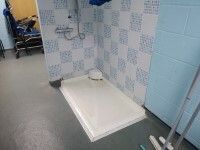 There is step free shower available. There are no grab rails next to the shower. The shower controls are twist operated. There is a sink available. 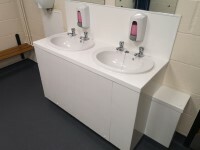 The height of the sink is 73cm. The sink has lever taps. The taps are not mixer. 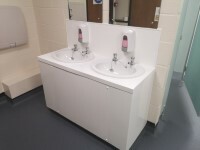 The height of the hand dryer is 110cm. The height of the coat hooks is 145cm. 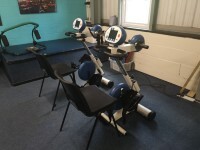 You are on Fitness Room. Skip to the next section. 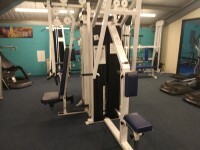 The Fitness Room is located to the left after you enter, at the rear of the corridor. 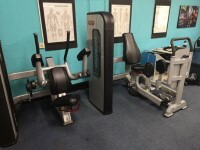 There is step free access to the Fitness Room. 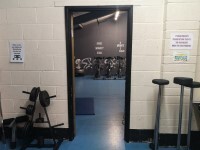 The door into the Fitness Room opens away from you (push), the door is single and has an opening width of 90cm. 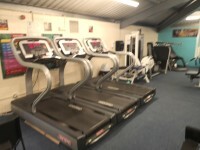 There is step free access throughout the Fitness Room. 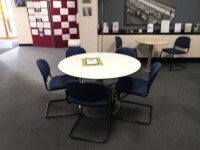 The surface of the flooring is carpet. 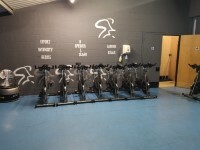 You are on Spinning Room. Skip to the next section. 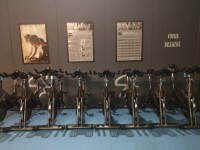 The Spinning Room is located within the Fitness Room at the rear. 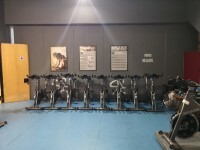 There is step free access to the Spinning Room. 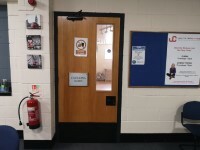 The door into the spinning room opens away from you (push), the door is single and has an opening width of 80cm. 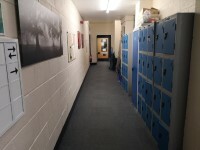 The surface of the flooring vinyl. 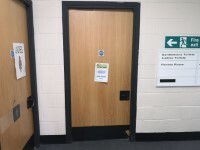 You are on Accessible Toilet(s) (Main Corridor). Skip to the next section. 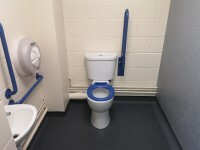 This accessible toilet is located to the left after you enter, at the rear of the corridor, next to the Fitness Room. 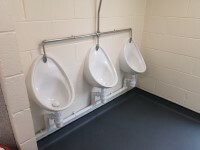 You are on Changing Area (Male Changing Area). Skip to the next section. 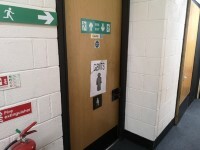 The changing area that was surveyed is located to the left after you enter, at the rear of the corridor. 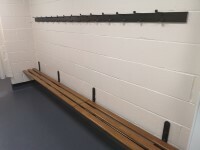 The facilities available within the changing area include; standard changing rooms/cubicles, standard showers and standard toilets. The width of the door opening is 93cm. 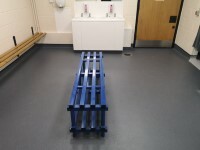 The type of flooring in the changing area is vinyl. 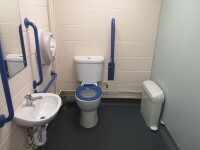 There is ramped/sloped access to the shower facilities. 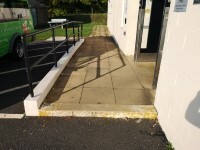 There is a short steep ramp into the showers. The shower head height(s) is/are fixed. 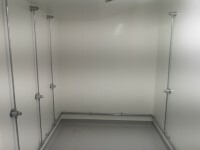 The height of the shower head(s) is/are 190cm. The shower control type(s) is/are push. 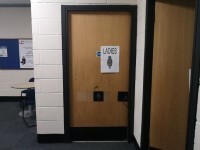 You are on Changing Area (Female Changing Area). Skip to the next section. 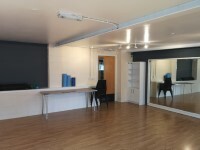 The changing area that was surveyed is located to the left after you enter, next to the studio. 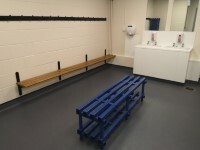 The facilities available within the changing area include; standard changing rooms/cubicles, standard showers, standard toilets and baby change facilities. 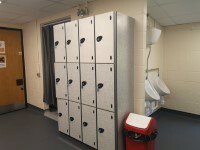 This is a female changing area. 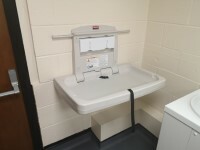 The height of the baby change table once extended is 88cm.